LONDON: 2 MARCH 2005 - Mercator Gold plc (AIM: MCR, MCRW) as operator of the Annean Joint Venture announces that on-going drilling continues to intersect significant high-grade gold mineralisation within broad zones of anomalous gold at resource-extension targets in the Yaloginda region near Meekatharra, Western Australia. Hole 04SUDD010 drilled from within the existing Surprise open pit intersected 2m @ 22.7 g/t Au from 73m down-hole, about 80m below surface. Hole 04SUDD010 and hole 05SUDD016, both drilled from the same collar position but in different directions within the Surprise pit, returned 141m @ 0.84 g/t Au and 177m @ 0.66 g/t Au, respectively. Initial drilling at Jess, the third of three resource-extension targets being drilled in the Yaloginda region, has provided initial encouragement, demonstrating zones of anomalous gold, including 8m @ 1.9 g/t Au from 106m downhole, 8m @ 1.2 g/t Au from 118m and 8m @ 0.9 g/t from 133m. Drilling is continuing to test potential for high-grade shoots. At Maid Marion, a brownfields exploration target 15km north of Meekatharra, the Company has drilled 93 air-core regional targeting holes, of which 13 holes returned gold grades over 0.5 g/t. These results, when combined with drilling data by previous operators, demonstrate a major corridor of gold mineralisation stretching for more than 8km between Maid Marion and Five Mile Well. One diamond core hole drilled to test the continuity of mineralisation, to test an IP anomaly and to obtain structural geology data, returned six significant intersections including 2m @ 15 g/t Au from 93m downhole. 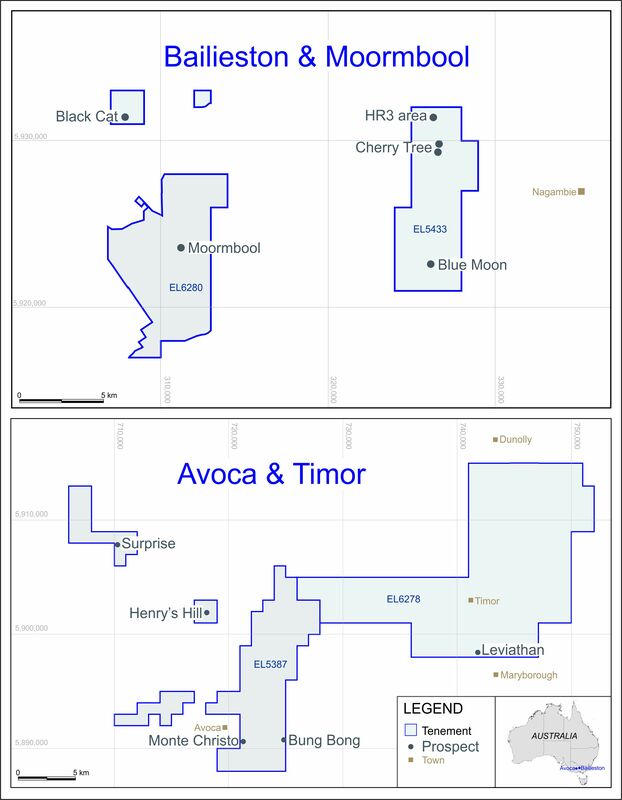 The Company has completed a £1.25 million share placement to institutional clients of Ocean Equities Ltd and Phillip Securities (UK) Ltd, which boosts treasury and allows the Company to maintain an aggressive drilling programme at Bluebird, Surprise, Jess and Maid Marion within the Annean Joint Venture Area. Surprise is the second of three resource-extension targets in the Yaloginda mine area, immediately south of Meekatharra, Western Australia, to be drilled by Mercator. The Company considers that each target has the potential to contain in excess of 500,000 ounces of high-grade gold. The targets are located within 4km of the St Barbara Mines Limited’s Bluebird mill that is currently on care and maintenance. Holes 04SURCDD010 and 05SURCDD016 were collared on the haul road within the existing small Surprise open cut and were drilled towards 247 degrees and 222 degrees respectively at –60 degrees oriented to go down at least 100m of host porphyry before passing out into country high-Mg basalt on the west side of the porphyry. Whilst drilled partly within the host rock, these holes are drilled across the gold-bearing sub-horizontal quartz veins. Hole 04SURCDD013 includes 6m @ 2.38 g/t Au, hole 04SUDD010 2m @ 22.73 g/t Au, and hole 05SUDD016 8m @ 2.7 g/t Au. The average grade of the complete Hole 04SUDD010 is 141m @ 0.84 g/t Au and for 05SUDD016 177m @ 0.66 g/t Au. These results demonstrate that Surprise has widespread anomalous gold, and within the anomalous zones are substantial high-grade sections, such as those intersected in 04SURCDD012 with 15m @ 45.1 g/t Au from 127m down-hole (announced January). The Company is currently involved in a comprehensive analysis of the Surprise drill results in the context of past drilling. Future drilling will target repetitions of the two high-grade zones already recognised, and the depth extensions of the porphyry plunging 45 degrees to south. Jess is the third of the Company’s resource targets in the Yaloginda mine area. Four reverse circulation holes of a ten hole programme have been completed. Holes 04JSRC002 and 04JSRC010 intersected mineralisation as indicated in the Table 2 below. Hole 04JSRC010 did not reach target depth as the rig suffered a mechanical problem, but returned several notable intersections, including 8m @ 1.94 g/t Au, and substantial widths of low grade mineralisation. The Jess results provide initial encouragement, demonstrating wide zones of anomalous gold. The company intends to complete its planned programme to test potential for high-grade shoots. At Maid Marion, the Company drilled 93 air-core holes as a regional targeting tool, with 13 holes returning gold grades over 0.5 g/t. These results, when combined with drilling data by previous operators, demonstrate a major corridor of gold mineralisation stretching for 8km between Maid Marion and Five Mile Well. One diamond core hole has been drilled at Maid Marion to test the continuity of mineralisation, test an IP anomaly and to obtain structural geology data. Hole 05MMDD001 had six significant intercepts including 2m @ 15 g/t Au from 93m down the –60 degrees angled hole. This and other intersections in the hole are in banded iron formation and mafic schist. The Maid Marion results, detailed in Table 3 below, provide significant encouragement, demonstrating substantial anomalous gold and the potential for high-grade shoots. Testing of regional exploration targets including Cassia and Tuckanarra. The Company recently completed a £1.25 million share placement to institutional clients of Ocean Equities Ltd and Phillip Securities (UK) Ltd, which boosts treasury and allows the Company to maintain an aggressive drilling programme under the Annean Joint Venture Area. Ocean Equities Ltd has been appointed joint broker to the Company and has introduced a number of new institutional shareholders to the Company, including Artemis Investment Management Limited, which last week notified the Company of an interest in 3,750,000 Ordinary Shares, representing 5.24 per cent of the Company's issued Ordinary Share capital. Dr Susan Vearncombe has been appointed as an executive director of Mercator Gold plc.